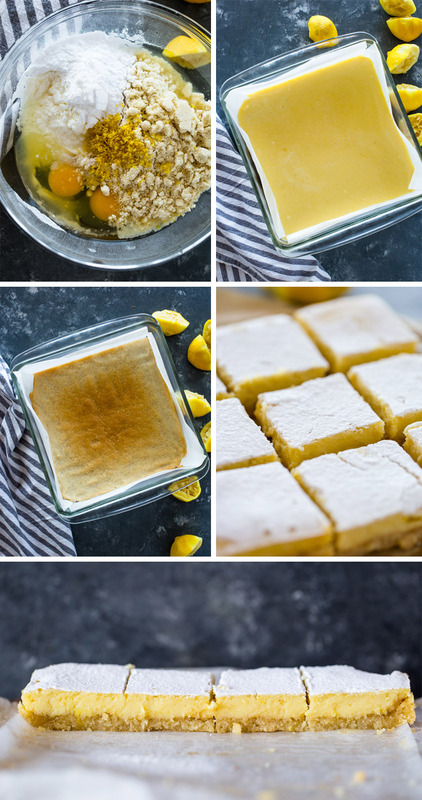 Decadent creamy low carb keto friendly lemons bars made with almond flour are a delicious keto dessert choice with just 4 net carbs per bar! Going keto does not mean giving up your favorite desserts. Thanks to almond flour and the variety of keto friendly all natural sweeteners available today, making your favorite desserts is easier than ever! If you’re in the mood for something sweet that won’t break your keto diet, then I’ve got you covered with these tart and creamy lemon bars. They are absolutely scrumptious that it’s hard to believe they’re actually keto! A serving of these keto bars may be small in size but BIG in flavor and sure to satisfy your sweet tooth. 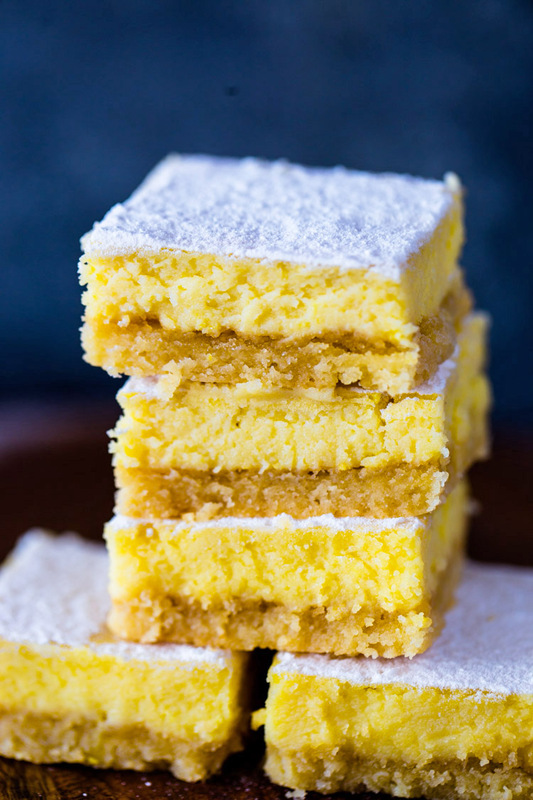 These lemon bars are super easy to make and are as easy combining the ingredients for the crust and as whisking together eggs, lemon, almond flour, and Erythritol. The Crust: The crust is essentially the base of the lemon bars and must be buttery, flaky and decadent. 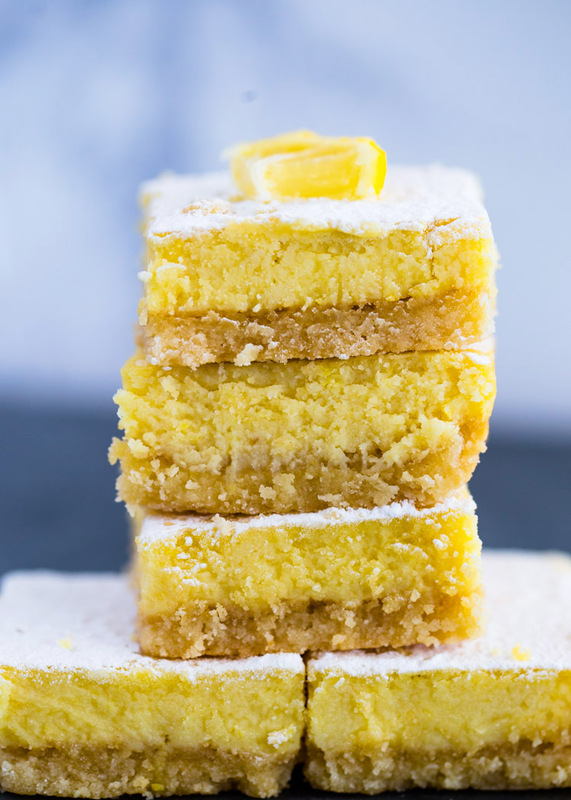 The crust for these keto lemon bars is made with the perfect ratio of almond flour and butter. I recommend leaving the butter out at room temperature or melting it halfway in the microwave. You can also use melted butter but it should be cooled. The filling: The filling must have the perfect mixture of creamy, tangy, sweet, and FRESH flavors. In order to achieve BRIGHT flavors, I recommend using fresh lemons. What sweetener do I use to make keto desserts? I get his question all the time when it comes to keto desserts and the answer varies widely based on the dessert your making. For these bars, I suggest using powdered erythritol or monk fruit sweetener. They bake like regular sugar and can replace sugar in most desserts without having to change the recipe. I have not tried this recipe with any other sweetener so if you find another type of sweetener that works, please LET US KNOW in the comments below! If you’re not doing low-carb or only doing paleo, (1/2 the amount) of honey or a 1:1 ratio of sugar will also work. Preheat oven to 350F. Combine butter, 1 1/2 cup almond flour, 1/4 cup erythritol, vanilla, and a pinch of salt. Press evenly into a 9x9″ parchment paper-lined baking dish. Bake for 15 minutes or until crust starts to become golden on the edges. While the crust is baking, in a large bowl, combine the ingredients for the filling and beat or whisk until lump free and fully incorporated. Pour the filling onto the pre-baked crust & bake for 25 minutes. Cool for at least 30 minutes, cut into 12-16 small squares and sprinkle with powdered erythritol if desired. Reduce the sweetener by 1/4 cup or to your taste if desired. ok so this puppy is in the oven now. The crust was very difficult to spread out into a even layer. The edges were browNed after only 13 mins And i didn’t want It to Burn so i just took it out and poured the filling over top. The crust definitely wasn’t even close to being cooked. The fillIng sort of mixed with the uncooked crust Layer. I have the timer set for 25 mins. We shall see! Also the filling did seem very grainy before i put it in the pan. MIne just did the same thINg. I could not get it even on parchment papet. NeXt time maybe i will just try cocOnut oil lines pan. HoPefully they turn out. Alot if ingreDients to waSte. I would Agree the taste is fantastic. Mine did not come out as preTty, but i would make again and Maybe cook the crust by greAsing a pan with coconut oil. I also think i can cut them in smaller portions because u just need a little taSte! GrEat keTo option for a sweettooth! Not sure why my phone is tYping Like this so sorry!!! Ok they were yummy! Yes the crust was difficult to sPread, but thE end product was yummy. Won’t say delicious but for a keto treat, yummy! I did cut The sugar in the filling by 1/4 cup. I just made these the other day and while the flavor is great, mine were Really grainy As if the “sugar” never dissolved. Kinda Bummed, but they’re still tasty. I used splenda in this recipe and used the same amounts and they came out awesome! 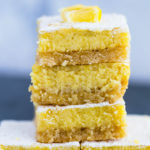 These Lemon bars look incredible! I cannot believe they are keto! Can’t wait to try. This looks sooo good, I love lemon dessert! totally pinning this!